In this article I discuss five technical indicators that are used by trend following forex traders.
. The book revealed a world of famous and less well-known traders who had used the trend following philosophy to make millions of dollars in the financial markets. The traders profiled in the book included John W. Henry, owner of the Boston Red Sox and Liverpool FC, and Ed Sekoyta, Money Manager and Market Wizard. The book became a big hit during the 2007-2008 financial crisis and the subsequent recession. This period saw dramatic falls in equity prices and equally dramatic rises in safe haven commodities like gold and silver. The US dollar strengthened and then fell again as the markets searched for safety and then reacted to the Federal Reserve and QE. These trends were hugely profitable for trend traders. The forex market is historically popular with trend traders. The relative value of currencies tends to be cyclical. The value of currencies rise and fall depending on many factors including economic growth, interest rates, government debt and commodity prices. This cyclical action can provide great long and short trades. 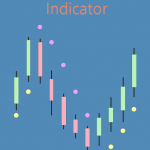 Trend following trading indicators can help traders to identify the dominant trend. Donchian channels are named after Richard Donchian who popularised their use. These channels measure the high and low over a period of time. They are then drawn on the chart as a line. Donchian channels were made famous by the Turtle Trading Experiment. The Turtles were a group of mostly inexperienced traders that were trained and funded by Richard Dennis. The experiment was the result of a bet with another trader, William Eckhardt, to prove whether or not trading could be taught. Richard Dennis proved his point and many of the Turtles went on to become very successful traders. For any trend follower, the best thing about Donchian channels is that they offer a guaranteed entry into every big move. The Turtle Trading strategy used 20 and 55 period Donchian channels to identify breakouts. A long trade would be opened on a break of the upper channel and a short trade opened on a break of the lower channel. One of my favourite indicators. I have done a number of articles and videos about the SuperTrend indicator. The SuperTrend is created by calculating the average price and then using the ATR to offset this. Crucially, because it is a trend following indicator, the indicator always moves in the direction of the trend. The indicator reverses when the price closes beyond the line. 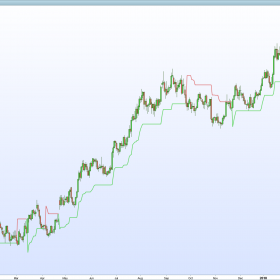 The SuperTrend is a great way of identifying the major trend. If you are trading on the daily timeframe, use the weekly SuperTrend to identify the trend. When the weekly trend is clear drop down to the daily chart and look for good trading opportunities. One of the simplest ways to keep on the right side of the trend is to use a moving average. Like Donchian channels, it is an easy way to always stay on the right side of the trend. The 200 period average is particularly popular. The 200 period EMA gives two useful pieces of information. Firstly, whether the current price is above or below the EMA. When the price is above the EMA look for long trading opportunities. When the price is below the EMA look for opportunities to go short. Keep an eye on crossovers of the 200 EMA because it is a chance for a change in the trend. Secondly, the strength of the trend can be seen in the slope of the EMA. During a good trend, the EMA will show a nicely steady up or down direction. A flat EMA suggests a quiet rangebound market. The Parabolic Stop and Reverse (PSAR) is another indicator that always wants to follow the trend. The name itself reflects the fact that the indicator is designed to accelerate in the direction of the trend before stopping and reversing. The PSAR always starts a downtrend from the most recent high and an uptrend from the most recent low. Like the SuperTrend it only moves in the direction of the trend. The PSAR tends to perform well in markets with nice long swings in direction. It does not perform very well in choppy directionless markets. Channels are a great way to make sense of price action. Standard deviation channels use a linear regression line for the central line and the upper and lower channel lines are offset using the standard deviation. Standard deviation channels show the direction of the existing trend and also help to provide opportunities for a resumption of the trend. The direction of the channel is the key guide to the trend. Trend following traders could use an oscillator such as the MACD to identify trading opportunities in the direction of the trend. Also, check out my article and video on: Backtesting a SuperTrend trading strategy. This entry was posted in Essential Traders Library, Learn to Trade and tagged Technical Indicators, Trend Following.